Superieure prestaties dankzij een compacte driver die overal is te installeren (achter de armatuur of op afstand, tot 200 m) en die topprestaties levert in alle omstandigheden, van een groot stadion tot sportterreinen, pleinen of parken. Volledig regelbaar met Dali of RDMDMX, daarom veel mogelijkheden: snelle verlichting, diverse verlichtingsniveaus en evenementenverlichting met dynamische verlichtingsscenario's. Beugel bevestigd met behulp van verschillende bevestigingspunten (3 bakstenen: 1 gat van Ø 22 mm en 2 gaten van Ø 15 mm - 2 bakstenen en 1 baksteen: 1 gat van Ø 22 mm, 2 gaten van Ø 17 mm en 2 gaten van Ø 15 mm). Frame bevestigd aan beugel met M10-inbusbouten en M8-stelschroef met de mogelijkheid tot horizontale verplaatsing (100 mm) (alleen beschikbaar voor de versie voor 3 bakstenen). Kantelbare LED-modules bevestigd op frame. Omkeerbaar balanker maakt hangende positie mogelijk en verschillende montageconfiguraties waaronder pendelmontage. High power LED floodlight for sport lighting and high mast area lighting. The floodlight offers a wide range of CCT/CRI/TLCI (4000K and 5700K, CRI from 70 to 90+ and TLCI up to 90+) to cover all the applications needs and flicker free operation suitable for HDTV broadcasting. 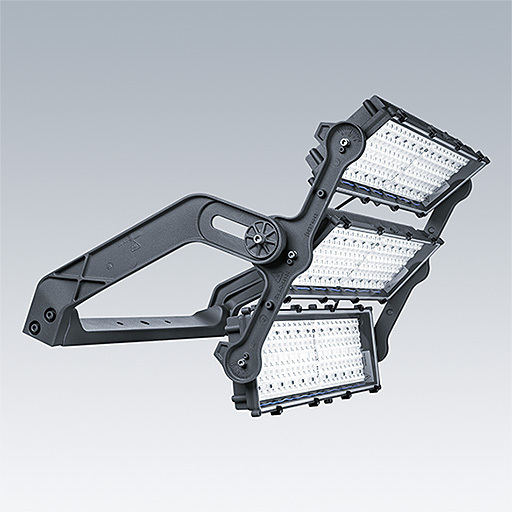 The floodlight allows to mix the optics and has tiltable LED modules to optimize lighting designs and minimize number of floodlights in an installation. Compact floodlight (30,7kg for three bricks version, 19kg for two bricks version and 9kg for 1 brick version), highly resistant (IP66, IK08), available with six excellent lighting distribution. To be completed with compact (560x150x120mm including cable glands) and light (6,1kg) Gear Box IP66 with RDMDMX or DALI control interface. Its housing made of die-cast aluminum with “fishbone” fins to guarantee a better thermal management in every single position and a full working range at ambient temperature -40°C/+45°C Equipped in the frontal panel with four different cable glands - 1 x M25 cable gland accepting cable diameter between 10 mm and 12 mm and wiring with screw terminals for wires up to 4mm2 for mains supply (120÷277V AC or 200-440V / 50÷60Hz), 2 x M16 cable glands accepting cable diameter between 5 mm and 10 mm for control IN/OUT and 1xM32 cable gland accepting cable diameter between 13 mm and 21 mm wiring with screw terminals for wires up to 4mm2 (one cable of 7-cores at length of customer choice not supplied by Thorn and used for electrical connection the luminaire) – and LED signal to indicate the status of the Gear Box. Lifetime greater than 50khrs. Surge level 10kV for Common mode and differential mode. Hot restrike and flicker-free up to 1000 frames per second (required for 100-50% output level) for HDTV camera. Can be installed on the bracket of the floodlight, inside the mast or remotely up to 200m from floodlight.